Letter dated January 25, 1872 sent from Oliver M. Jones at Canton Point, Maine, to his mother, Arabella R. (Newman) Jones and sister, Eliza Ann Jones at 29 Magazine Street, Boston, Massachusetts. 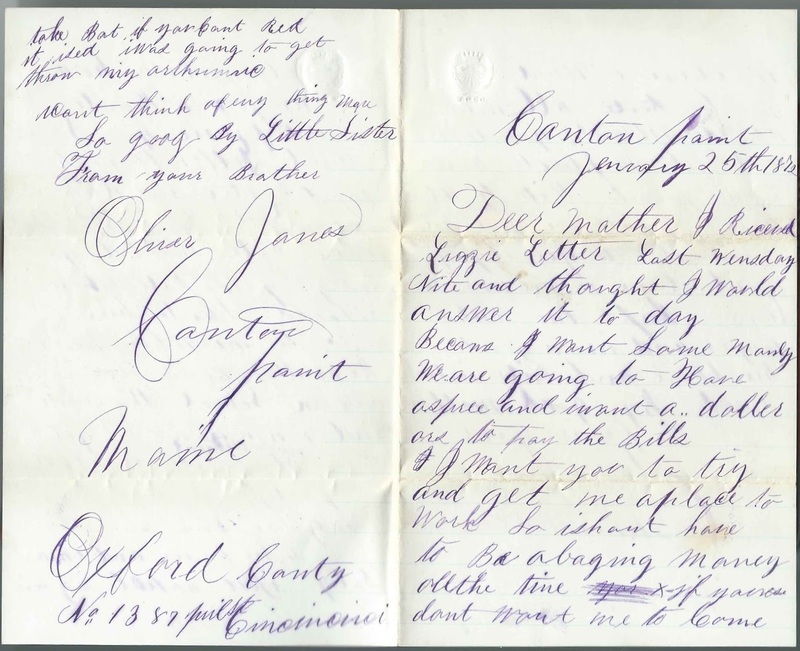 Arabella had apparently recently moved to Boston, or was on a visit there, as she was enumerated at Dixfield, Maine at the time of the 1870 Census. 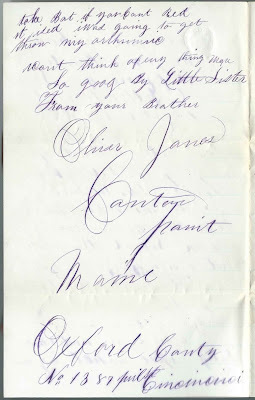 In 1873, Oliver's sister Eliza Ann Jones would marry George Monroe Kenney, son of Willard and Mary Polly Cummings (Staples) Kenney. Eliza and George made their home at Leeds, Maine, and raised four children. 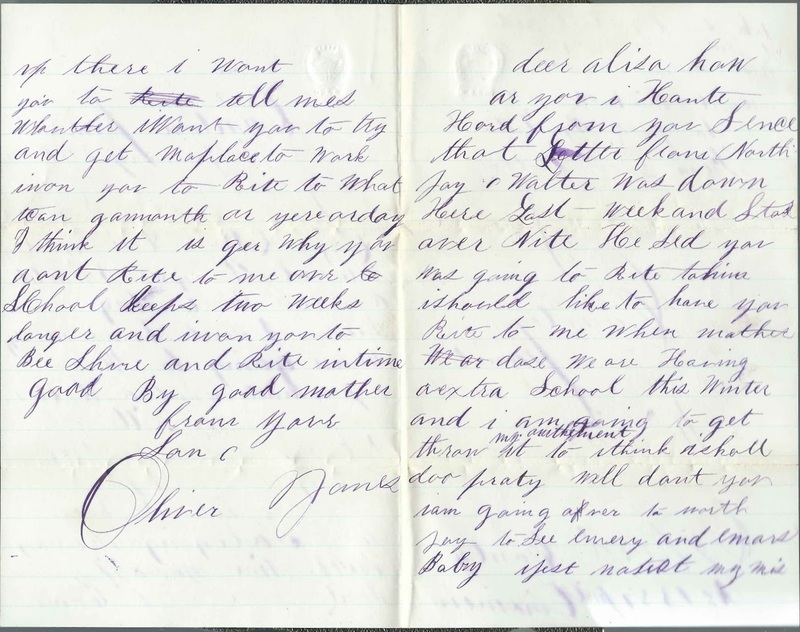 See another post that features an invitation to the 25th wedding anniversary of Charles F. Kenney and wife Laura Annie (Ingalls) Kenney. 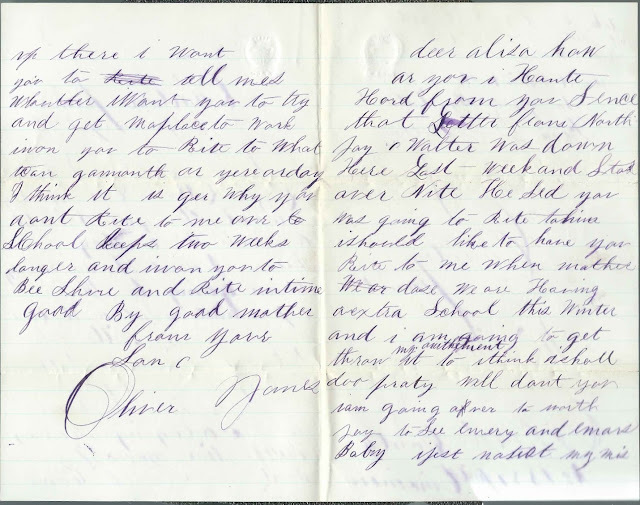 The invitation was enclosed in an envelope addressed to G. M. Kenney, presumably Charles' brother George M. Kenney and Eliza A. (Jones) Kenney. There are two other envelopes, sadly missing their contents,one addressed to Eliza A. Jones at Dixfield, Maine, and the other to Eliza A. Kenney at East Dixfield, Maine. 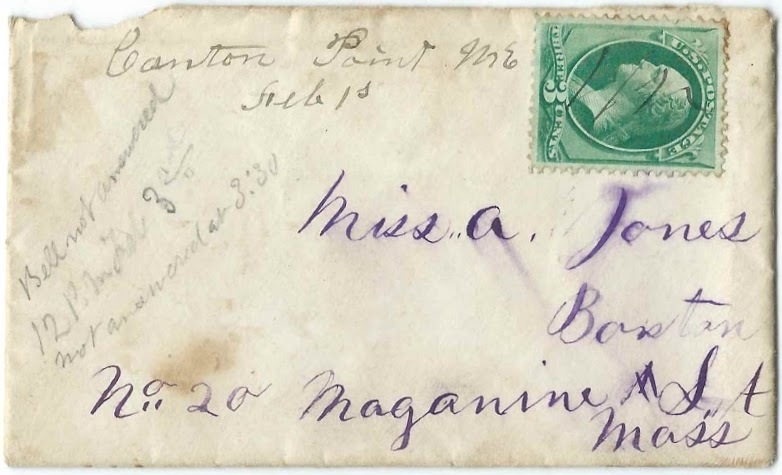 There's also an empty envelope that appears to have been addressed to a sister of Oliver and Eliza - Nancy Elizabeth Jones at Lewiston, Maine. 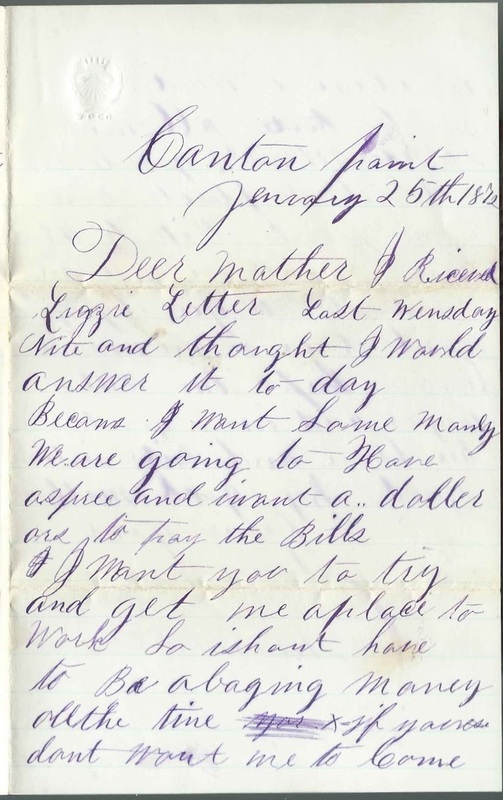 Nancy would marry 1) Frederick Henry Wilson, with whom she had a son Frederick Holland Wilson who changed his name to Frederick Holland Wilson-Cutler; 2) Dr. Arthur Hamilton Cutler. 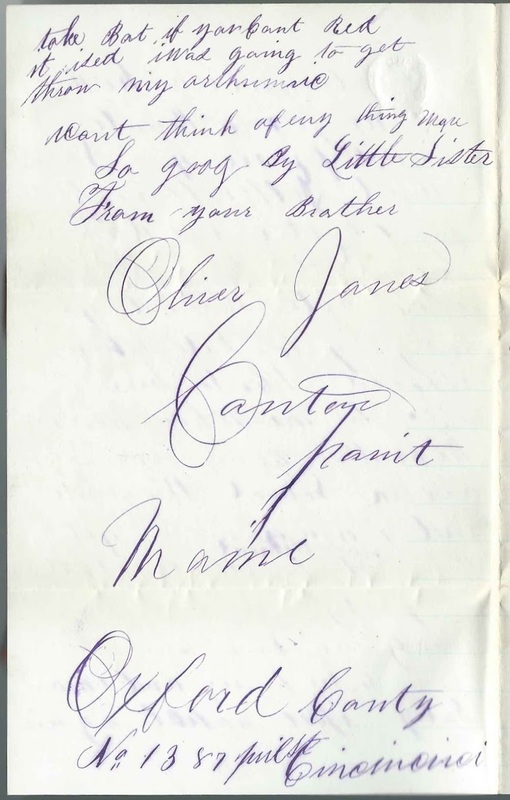 Oliver M. Jones was born March 9, 1857 at Jay, Maine, son of Lorenzo and Arabella Rarren (Newman) Jones. Most online references give his middle name as Moses. Intriguingly, there's an Oliver Moore Jones of the same age, and born in Maine, listed as a voter in California in 1898. 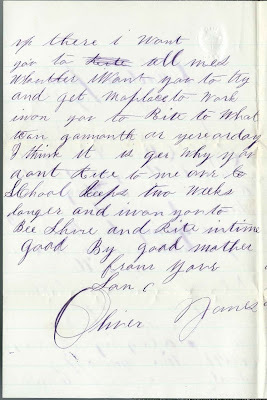 After his stint in school at Canton Point, Maine, at the time this letter was written, Oliver and his younger brother Walter Scott Jones moved to Dakota Territory, where the 1880 Census found them living with their cousins, sons of Gideon Ellis Newman, Sr., a brother to Oliver's mother Arabella Rarren (Newman) Jones. At that point, I lost track of Oliver. Brother Walter married Wisconsin native Laura Francis Leach in Dakota Territory and had two daughters, one of which died young. Sadly, Walter himself died in 1892 at Dixfield, Maine. 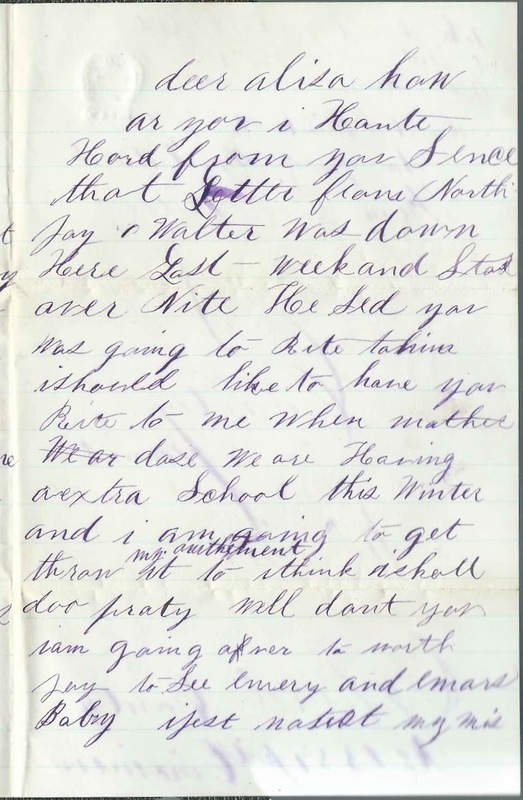 See a close transcription below the images; please add your comments to fill in the blanks or correct any mistakes. 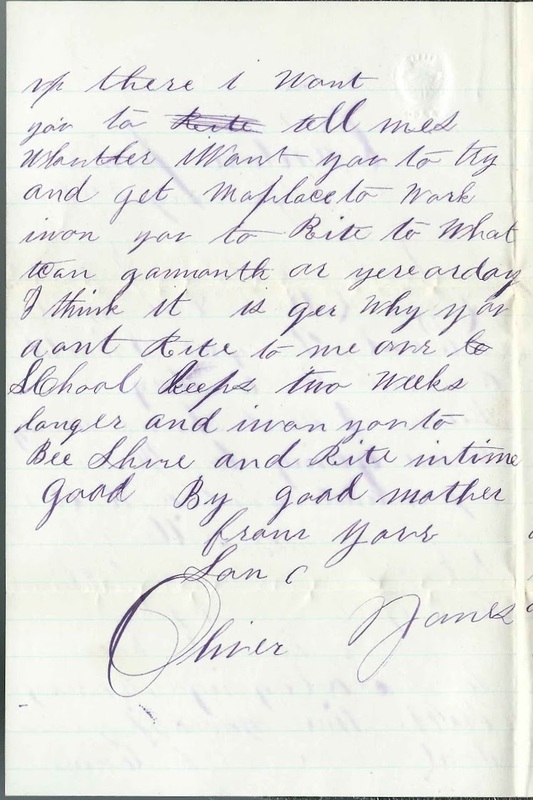 At the end of his letter, Oliver mentioned an address at Cincinnati. Whether he was in school there, and on a break at Canton Point, Maine, or was planning to go to Cincinnati, I don't know. At least one of his Newman cousins was born at Cincinnati, Ohio, so he apparently had a reason to go there. Loose transcription - corrections and/or additions welcome! 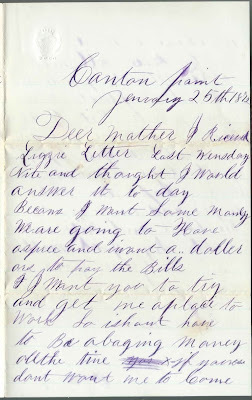 I received Lizzie's letter last Wednesday nite and thought I would answer it to-day because I want some money. We are going to have a spree and I want a dollar to pay the Bills and I want you to try and get me a place to work So I shan't have to be a begging money all the time. If you don't want me to come up there I want you to tell me so ___ I want you to try and get me a place to work. 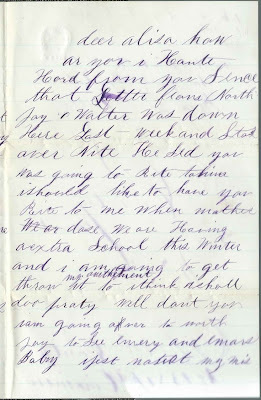 I want you to write to what ____ I think it is ___ why you won't write to me. [?] School keeps two weeks longer and I want you to be sure and write in time. Good Bye, good mother, from your son, Oliver Jones.